Singapore-based Grab, a provider of on-demand transportation and a mobile payments platform intends to add 200 electric cars with DC-fast charging capability to its fleet. The first model is the Hyundai IONIQ Electric, although it's not said that it will be the only model. The first cars will enter service from early 2019. At the same time, Grab starts a strategic partnership with fast charging network SP Group (SP), which by 2020 plans to install 500 AC and DC charging points in Singapore. As Grab provides a platform for taxi drivers, it hopes that those who sign up to use EVs, will be able to replace conventional cars by using DC fast chargers, but also improve earnings by up to 25%. Grab and SP will also use the data to study EV usage patterns and behaviours to improve the accessibility and utilization of EV charging stations. "Driver-partners on this new model will enjoy preferential EV charging rates from SP, at all their charging stations island-wide. With the cost benefits offered by EVs, they can expect to earn up to 25% more in daily income compared to those on a regular petrol vehicle and up to 20% more daily income compared to a hybrid vehicle." "Grab and SP will study EV usage patterns and behaviours to improve the accessibility and utilisation of EV charging stations. SP plans to install its charging points in convenient locations, many within close-proximity to coffee-shops and food outlets. This will allow Grab driver-partners to match their charging time with meal and driving breaks." "Specific details on pricing of charging facilities and EV models will be disclosed towards the end of the year when SP Group is expected to set up the first 30 charging points. With a sporty style and spacious interior that will appeal to Grab driver-partners, the new EV model boasts an estimated range of 400km per charge. Driver-partners only need approximately 40 minutes at SP’s high-speed DC charging points for a full day’s worth of driving on the Grab platform. In addition, some of SP Group’s venue partners will offer discounted parking to EV drivers using SP’s charging network. This partnership provides Grab driver-partners with greater time and cost savings, maximising their daily income. Grab today operates the largest network of environmentally friendly vehicles such as EVs and hybrid vehicles in Southeast Asia and plans to further expand its electric mobility fleet. Grab and SP Group believe in the impact of EVs on improving the overall health and liveability of cities. With a pervasive charging network and growing investments in EV, Singapore is one step closer to meeting its sustainability goals." “We have heard from our driver-partners that a faster charge time and longer EV driving range are important considerations for them when making the switch to EVs. We have taken their feedback on board and have negotiated the best deals to bring them concrete savings and the best vehicle model to cater to their driving needs. We are proud and happy to partner with SP, which has a long history of serving Singaporeans. 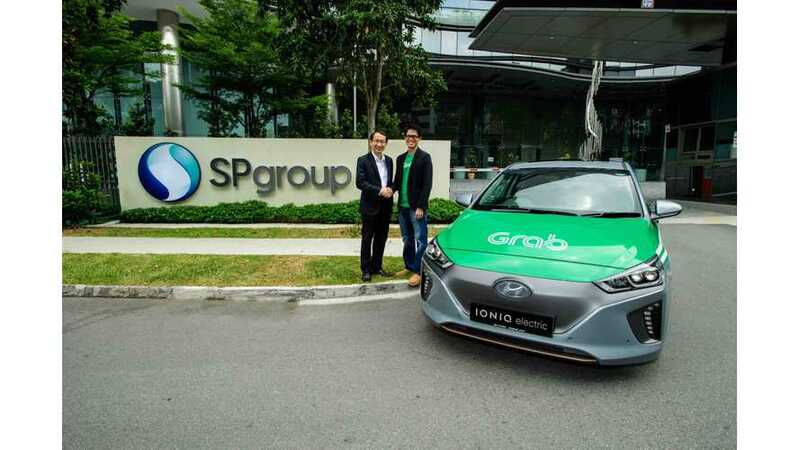 With SP joining our consortium of EV partners, Grab is in a unique position to help drive a cleaner, greener Singapore by encouraging more of our drivers to adopt EVs. Grab operates the largest electric and hybrid vehicle fleet in Southeast Asia today, and we are committed to delivering the benefits from EVs to more of our driver-partners,”. “We are pleased to enable the success of Grab’s electrification efforts through our plans to launch Singapore’s largest public electric vehicle charging network. The pervasive fast-charging network will provide Grab’s EV drivers with convenience and speed in charging their vehicles, while helping them to achieve energy and cost savings. This will accelerate the wider adoption of EVs in Singapore and support the nation’s efforts to reduce our carbon footprint,”.